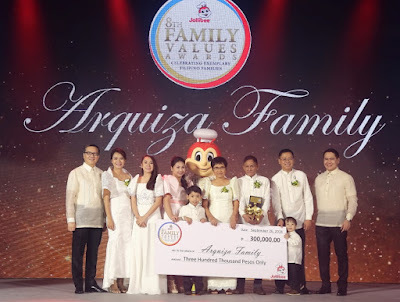 On its 40th year, Jollibee continues to honor exemplary families who choose to be great for others in the 8th Jollibee Family Values Awards. 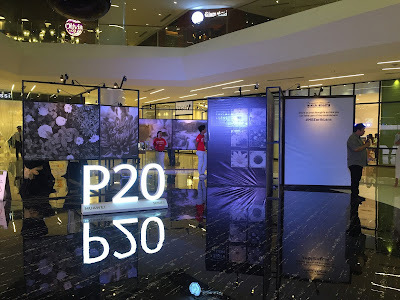 Their inspiring stories and advocacies were once again the main highlight during the Gabi ng Parangal para sa Pamilyang Pilipino held at the Blue Leaf Cosmopolitan in Quezon City. This was the culmination of an exhaustive months-long search for outstanding nominees throughout the country and the rest of the world. Hailed for their family values-driven advocacies that sparked hope and ushered change in their chosen communities, the 8th JFVA winning families include: Mr. Reynaldo and Mrs. Julieta Arquiza and family of Camarines Norte, for establishing a network of libraries in public schools and daycare centers; Mr. Nilo and Mrs. Menilia Delos Reyes and family of Caloocan City, for providing prosthetic legs, wheelchairs, crutches and other mobility devices to persons with disability (PWDs); Mr. Ryan and Mrs. Ma. Maricel Homan and family of Sorsogon, for creating mobile classrooms and providing tutorial sessions to students living along riverbanks and coastal areas; Mr. Henry and Mrs. Lisa Manuncia and family of Quezon City, for providing trauma counselling and debriefing services to people in disaster-stricken areas; Mr. Jason Roy and Mrs. Cherry Joy Sibug and family of Kidapawan, North Cotabato, for improving the education, livelihood, and health of indigenous people; and Mr. Graciano Alegado and family of California, USA, named as OFW Family of the Year, for conducting medical and dental missions for thousands of patients in Tawi-Tawi. 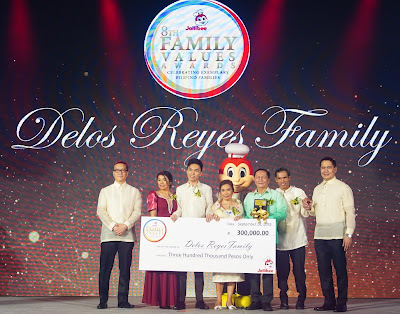 Jollibee also conferred special citations to families who are focused on specific advocacies. The Special Citation for Education was presented to Mr. Virgilio and Mrs. Ana Maria Bacudio and family of Manila, for their Jeepney of Hope library project which provides Mindoro’s Mangyan tribe with access to books, while Mr. Auke and Mrs. Susana Idzenga and family of Bacolod City were the recipients of the Special Citation for Agriculture, for their Alternative Indigenous Development Foundation, Inc. which develops alternative technologies that answer the needs of small-scale farmers. Recognized for conducting free Math tutorial programs for children in their hometown, the Special Citation for Youth Empowerment was presented to Mr. Alexander and Mrs. Michelle Rubico of Calamba, Laguna, while Mrs. Ruth Roa and family of Australia received the Special Citation for Children (endorsed by Children’s Hour) for building and operating an orphanage in Davao del Sur. Aside from getting recognition as 8th JFVA winners, the Delos Reyes family was also presented with the Special Citation for PWDs (endorsed by National Council on Disability Affairs) while the Sibug family was honored with the Special Citation for Indigenous People (endorsed by KATRIBU). 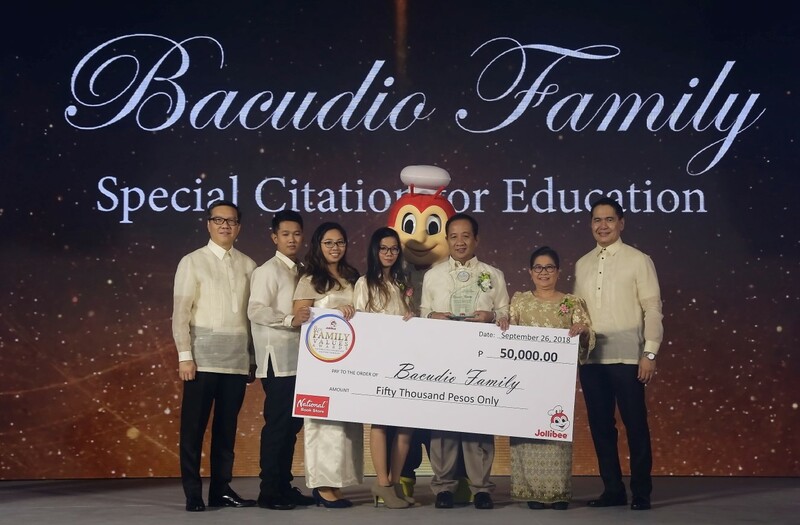 The six winning families each received a P300,000 cash prize, a brass trophy designed by renowned sculptor Michael Cacnio, and P10,000 worth of Jollibee gift certificates. The special citation recipients, moreover, were each given P50,000 in cash, a plaque of recognition, and P3,000 worth of Jollibee gift certificates. The 8th Gabi ng Parangal sa Pamilyang Pilipino centered on the theme of bunga, signifying how the values of each winning family served as the seeds that produced bountiful fruits of advocacy programs that benefit others in the community. The task of sifting through volumes of submitted entries was taken on by a selection committee composed mainly of veteran JFVA judges. Chaired by parenting and relationship consultant Maribel Dionisio, the esteemed jury is composed of TV host and news anchor Edric Mendoza, renowned writer and inspirational speaker Francis Kong, lifestyle columnist and children’s advocate Audrey Tan-Zubiri, actress Dimples Romana, and TV host and news anchor Christine Jacob-Sandejas. Completing the panel of judges were Jollibee Philippines HR Head Jazel Mendoza, Jollibee Group Foundation Executive Director Gisela Tiongson, and Jollibee Brand CMO and Jollibee Philippines Marketing Head Francis Flores. The 8th JFVA is made possible with the support of campaign partners Coca-Cola Philippines, Jollibee Group Foundation, and Maynilad; special citation partners Children’s Hour, National Council on Disability Affairs, and KATRIBU; official hotel partners Crowne Plaza and Holiday Inn; and sponsor HKTV.